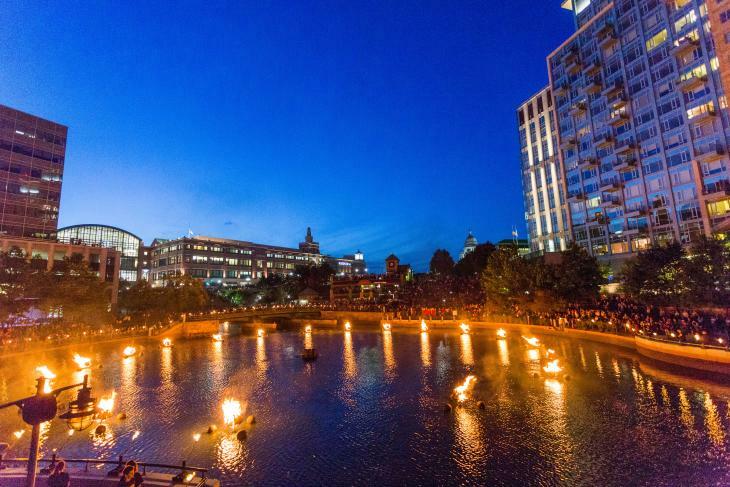 WaterFire, one of Providence’s signature events, returns Friday, April 28 with a basin lighting in Waterplace Park. A must-see for anyone visiting the city, the award-winning fire sculpture and free event, is being sponsored by the Rotary Conference 2017, LLC. The evening will begin with a 16-torch procession, followed by the lighting ceremony at 8:30 p.m. The fires will remain lit until 11 p.m.
Head to Providence, enjoy the incredible dining scene, take a stroll, and enjoy the ambiance of crackling flames and scent of cedar and pine. The Capital Grille and Jacky&apos;s Waterplace Restaurant offer a front-row seat to the action and are great spots to dine or grab a cocktail. Continue along the cobblestone walkways to explore a few other water view restaurants such as Cafe Nuovo or Hemenway&apos;s.
Stay tuned for the launch of the 2017 WaterFire schedule.